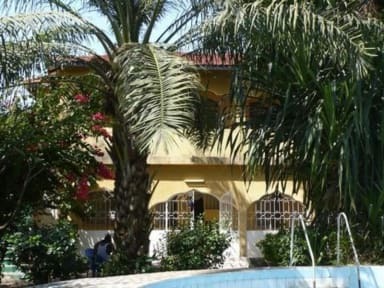 One World Village Guesthouse i Bakau, Gambia: Bestill nå! 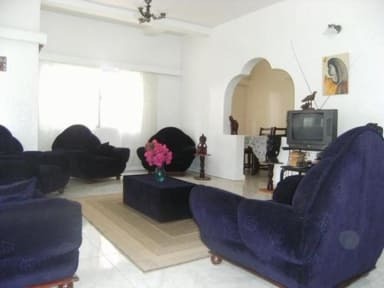 One World Village Guesthouse has a lushy, beautiful garden with a big variety of fruit trees and tropical plants as banana, papaya, orange, mango, pomegrant, guava, passionfruit and nooni. There is a newly built circular pool in the middle of the tropical garden. We have three rooms upstairs, all with fridge, parlor, bedroom, shower, hot water and ceiling fan. From there you have a nice view over the garden. Downstairs are four more rooms for 1-2 people. The small kitchen is free to use for everybody. The guesthouse has partly solar energy and recycling of organic waste materials. Method of Payment upon the arrival: Cash preferred!